This is how much God loved the world; He gave his Son, his one and only Son. Today is Good Friday. Thousands of years ago, my Savior carried a heavy cross on his back to Calvary. He did it for me, and for you. He took all my sins, past, present, and future, into himself, so I could live. He suffered the rejection of his Father, so I could live. He did all of this for you too! They turned away from him. because he loved me, and you. We are going to a church service tonight that will remind us of how much Jesus sacrificed for each one of us. The gift of freedom he gave to me, no condemnation, shame, and his forgiveness. 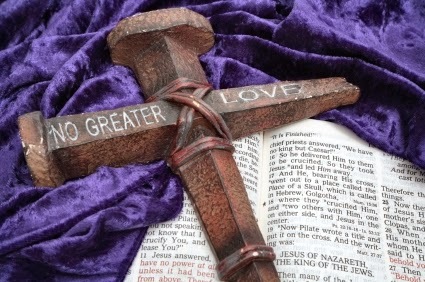 I want to be reminded of his love, the depth, width, and the breadth. I know it can't be measured, for it is endless. The gift of his Spirit that surges within me and leads my daily life, and brings me power. The gift of Jesus ever present and alive. Good Friday was oh so Good, because of his love and the life that came from his tomb and into my heart! Say That Again, Sweet Jesus, you are Love, and you live!